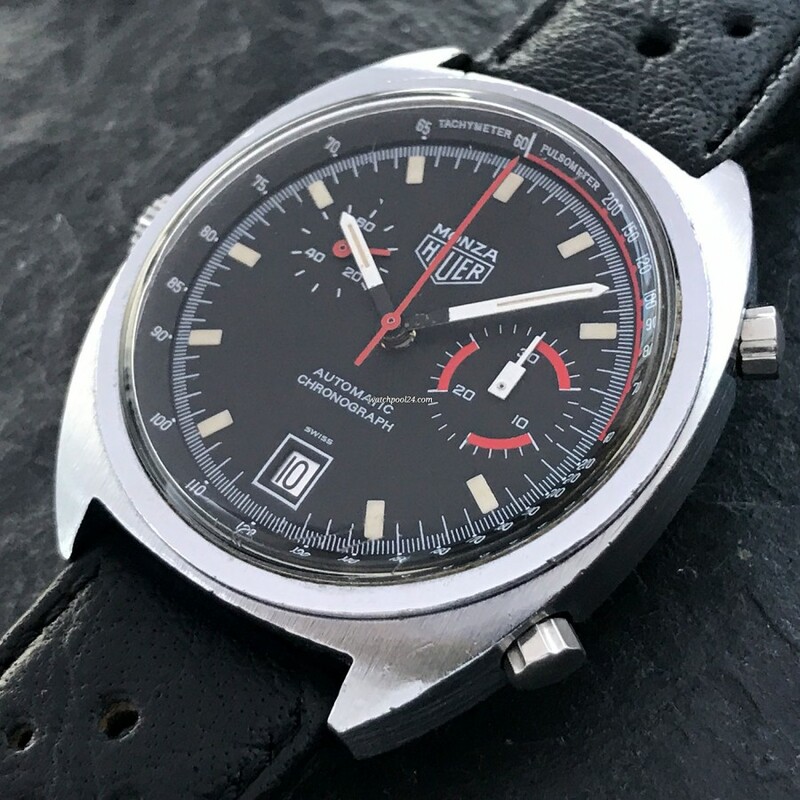 Here we offer you another Heuer Monza from the 1970s with a chrome-plated case. This model hat the reference 150.511 and is considered by vintage collectors rarer than the PVD-coated model. This vintage chronograph has a sporty black and red color combination. The dial is in great condition without any noteworthy quirks. The small second is at 10 o'clock. The date at 6 o'clock. The tritium luminescent in the hour markers is completely intact. This vintage watch has a combined tachymeter and pulsometer scale. The brass case is chrome-plated and has been preserved in great condition. On the case back, the reference and serial numbers are clearly readable. The Heuer Monza watches were powered exclusively by the Heuer automatic caliber 15 - a successor to the famous Caliber 11. The movement was checked and runs flawlessly. All in all, this Heuer Monza is a sporty-looking, rare vintage chronograph named after the famous race track in Monza, Italy. Only a few chrome-plated Monza watches survived and even less in good condition are offered on the vintage watch market today.